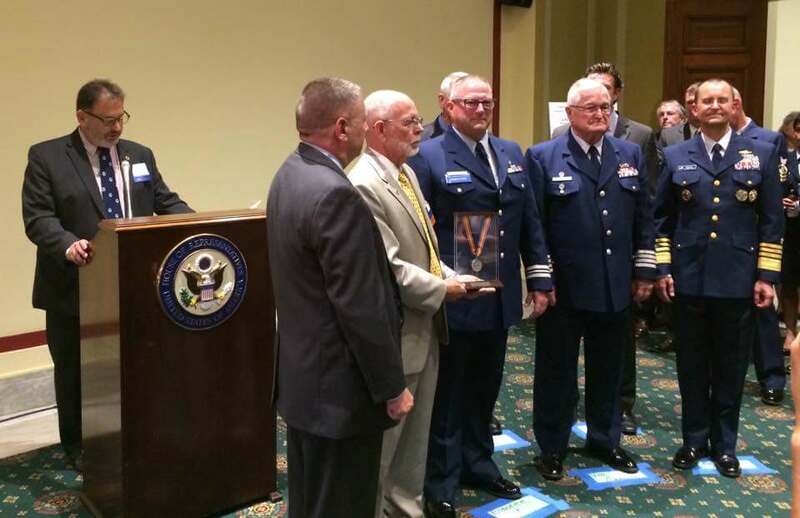 The organization, Association for Rescue at Sea (www.afras.org), recognizes heroism in the maritime community. They also raise money for voluntary coast guards worldwide. The Silver Award (one of several different awards presented that evening) is given to a US Coast Guard Auxiliarist. The volunteer Coast Guard Auxiliarist must have saved a life at sea (or in this case a river). Mr. Porter actually saved two lives at different times during the day. This feat was accomplished at the Bullhead Regatta, held on the Colorado River in August 2015 near Bullhead, AZ. This year we donated in excess of $50,000 to organizations in the Caribbean Basin, Tanzania and to the volunteer Coast Guard organizations involved in the Mediterranean/Aegean crisis. The members of AFRAS work for a wide variety of businesses or are retired (mostly from the Coast Guard). They are able to arrange their business duties around their volunteerism and yield what we feel are positive results for our community, nation and the world. Does your organization foster the spirit of giving back the the community/country? And if it does, what do you do for your employees and/or those organizations? Bellmore, NY – SBA * Consulting, a provider of C-Level consultants to the mid-market is expanding its service offering. They are now assiting with emergency planning and business continuity services including mitigation and recovery. Sandy brought over 5+ feet of seawater into our offices. The surge that hit our seaside community was the highest recorded in over 50 years. This according to the locals residents who have lived since the community was built. In prior storms, our Corporate Office was either dry or sustained 6-8” of water. Our precautions for Sandy included raising all assets 4 1/2 – 5 feet above the floor. Unfortunately, this time, it wasn’t enough. We can apply lessons-learned and assist other businesses in the mitigation, business continuity and recovery phases of any business disaster. Now is the best time, to ascertain where deficiencies lie, and correct them. Why is this the best time to look at business continuity and disaster planning? Two reasons; look at the effects of Sandy on the businesses that took the brunt of the storm. More importantly is that the best time to plan is when you have the time to incorporate mitigation policies prior to a disaster! It makes little business sense to re-establish bad or inefficient systems, policies, programs and plans. SBA * Consulting CxO’s can bring C-Level, Senior Managerial and Emergency Planning experts to the table; enabling companies the ability to create, manage, facilitate and train their staffs in best-practice approaches. Utilizing our unique 360 degree GAP Analysis program, we can find those deficiencies, address them and improve all aspects of your company. By instituting proper emergency and business continuity plans there are multiple benefits. New approaches can improve efficiency, productivity, and lower costs. They can raise sales and revenues, prevent catastrophic losses and generally increase overall profitability of the company. We have the breadth in our Consulting Cadre to address your vertical market with Consultants that average over 25 years of experience each. Since no single problem is the purview of one single department (called silo thinking), we have experts in various fields that can help. We can provide CFO services, militarily trained Supply Chain Management consultants, COOs, CIOs, Chief Marketing Officers and Human Resource professionals plus other professionals; all able assist your company in growing.